Download a blank fillable Dd Form 2937 - Election Of Retirement Coverage For Reemployed Civil Service Retirement System (Csrs) And Csrs-Offset Discontinued Service Retirement (Dsr) Annuitants in PDF format just by clicking the "DOWNLOAD PDF" button. Complete Dd Form 2937 - Election Of Retirement Coverage For Reemployed Civil Service Retirement System (Csrs) And Csrs-Offset Discontinued Service Retirement (Dsr) Annuitants with your personal data - all interactive fields are highlighted in places where you should type, access drop-down lists or select multiple-choice options. CSRS discontinued service retirement annuitants. ROUTINE USE(S): The DoD "Blanket Routine Uses" apply. DISCLOSURE: Voluntary; however, failure to provide the requested information may result in a missed opportunity to elect retirement coverage. 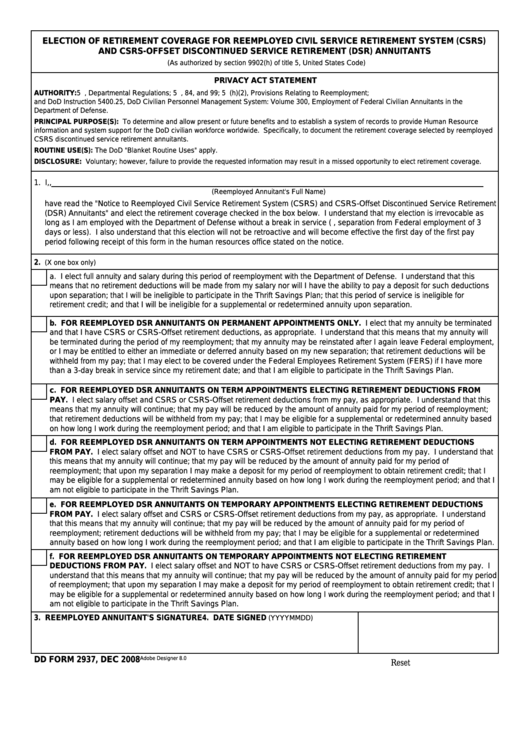 period following receipt of this form in the human resources office stated on the notice. retirement credit; and that I will be ineligible for a supplemental or redetermined annuity upon separation. than a 3-day break in service since my retirement date; and that I am eligible to participate in the Thrift Savings Plan. on how long I work during the reemployment period; and that I am eligible to participate in the Thrift Savings Plan. am not eligible to participate in the Thrift Savings Plan. annuity based on how long I work during the reemployment period; and that I am eligible to participate in the Thrift Savings Plan.